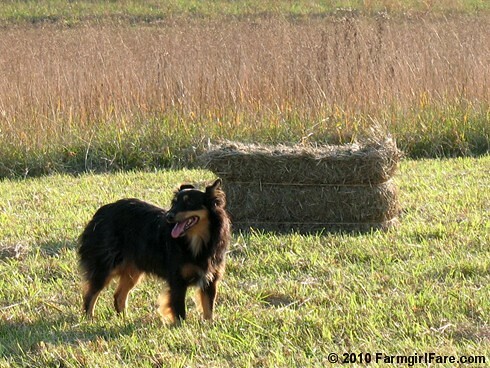 We're very grateful to our ever faithful stock dog Lucky Buddy Bear, who took time out from doing chicken surveillance (Bear LOVES his new job—more about that soon) to offer moral support and root us on with his winning smile while we were toiling away in the hayfield yesterday and today. © 2010 FarmgirlFare.com, the so ready for dinner and a glass of champagne (Happy 10/10/10!) foodie farm blog where I don't want to talk about Haying Season 2010 Part 2 until I've blocked it out for a few days first, except to say that it's finally over, everyone survived, it may have actually been worth it—and I hope we never put up hay in October again. The rest of the story, with photos, will be up sometime this week. I think. does seem an odd time of year for haying photos - but you'll be so glad you get a second haying done (after the dramatic and rough events of summer) when it is cold and you have all that nice hay for your sheep (oh and donkeys too of course!) Enjoy a well earned night's sleep and give yourself a bit of a break - doctors weren't joking about the length of time for a body to completely recover from such a trauma! Hurray! So glad to hear the haying is done! And hurray to your hunky farmguy for making sure that you take it easy. Now you must rest, rest, and rest. There couldn't have been any toiling with hay bales in the dark, now could there? I can answer my own question. Not only COULD there, I'm pretty sure there WAS. Boo. Just hauling the 300 square bales we got was awful. Lucky Buddy Bear is really furry and cute I know he must love his new job. Hope your feeling better and have recovered from the other time. I am still looking everywhere I go and make sure I do not go around the roses without a garden hoe and my dog. Someone sent me an email the other day with a photo of bluebonnets in texas they were pretty except for the last photo was of u know whats over in them and I said I would not go there!I guess they love to be in flowers and pinestraw.